ONDC’s 4 athletes reached the podium on EVERY EVENT ENTERED! Our Tier 2’s first competition comes to a close! Every once in a while I have reminders of why I love this sport and the life lessons it provides. This weekend was an excellent example of that. To recap our results, the ONDC finished off the competition with 6 Gold Medals, 2 Silver and 1 Bronze. Our 4 athletes reached podium finishes on EVERY EVENT WE ENTERED! This weekend was more than just results however. This was an excellent display of our comradely and sportsmanship along with a testament of overcoming our limitations and fears. To begin with our oldest, Marianne competed on the 1m board this weekend. to keep things to short she has a limited amount of sight in her eyes. 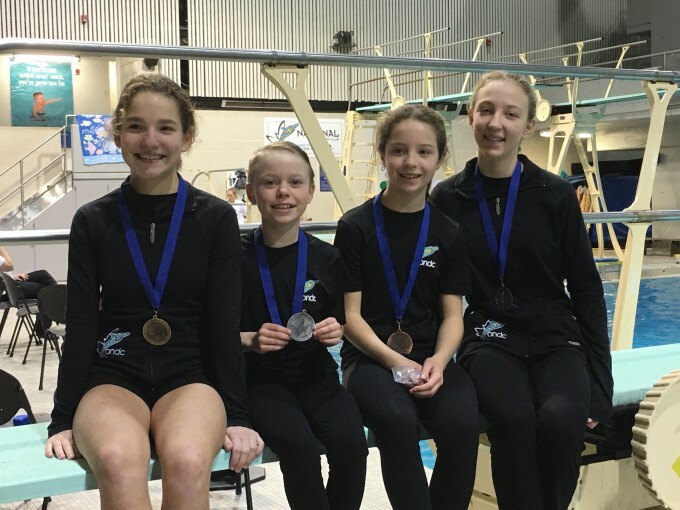 She was not restricted by her limitations and received exceptional scores on almost every one of her dives and finished with a silver medal. For the head referee to come to our coaches and say “she was absolutely amazing” was a huge testament to her skill and her coaches hard work. The ONDC could not be more proud of her! Congratulations Marianne. Talia joined the ONDC this past September and has been working very hard to get her dives ready for her very first competition. She went into this weekend with a few nerves and fear of the unknown not having competed in the sport of diving. She showed that she is one to be reckoned with coming off her weekend a TRIPLE GOLD MEDALIST! Not too shabby for her first meet! Congratulations Talia! This weekend was also Gabriele’s first competition in her diving career. We couldn’t be more proud of her after overcoming a week of sickness prior to the competition. She represented our club beautifully and ended her weekend with one gold and one silver medal. Congratulations Gabriele! Finally our youngest, Audree, entered her first competition as a member of the ONDC. She showed tremendous skills in her dives on every event. Your hard work and concentration over the weekend finally paid off with double gold medals and one silver medal. Congratulations! I also need to thank the rest of our ONDC family. We showed everyone the sportsmanship and support we all have for our fellow athletes. We had the competing athletes, many family members, and many of our other athletes and their families coming to cheer on our team. Our sportsmanship was unparalleled and I thank each and every person who came out to support our athletes! This quality is the cornerstone of the ONDC!